Introducing fabric to the inside of any space improves the acoustics, helps with solar glare, creates a feature and can be used to define a space. This article will walk you through the benefits of interior fabric applications. Modern offices, atriums and public spaces often suffer from problematic acoustic reverberation issues, due mainly to the prevalence of highly reflective surfaces such as floors, furniture, glazing, walls and ceilings. These hard surfaces can result in undesirable echo effects that contribute to a high level of background noise and make normal conversation difficult. High-frequency acoustic absorption can easily be achieved through the application of acoustically engineered fabrics or by the addition an absorbent foam or quilt behind an acoustically-transparent fabric, resulting in lower levels of background noise and a more pleasant experience for all visitors. Specially engineered solar meshes can be utilised to control natural daylight, offering shading benefits while maximising natural light. Regulating natural daylight with operable systems of moveable fabric structures will not only reduce lighting bills, it can also reduce air conditioning bills during hot summer months and heating bills during bright winter days. The semi-translucent nature of the meshes allows diffused light to permeate while maintaining a view of the scene behind, ideal where a sense of space and openness needs to be maintained. Fabric membranes can carry quilting such as Rockwool to their rear face to offer thermal insulation properties if requires. Conversely, if ventilation needs to be maintained, then open-cell fabrics of varying mesh sizes will allow natural (or controlled) airflow to permeate. 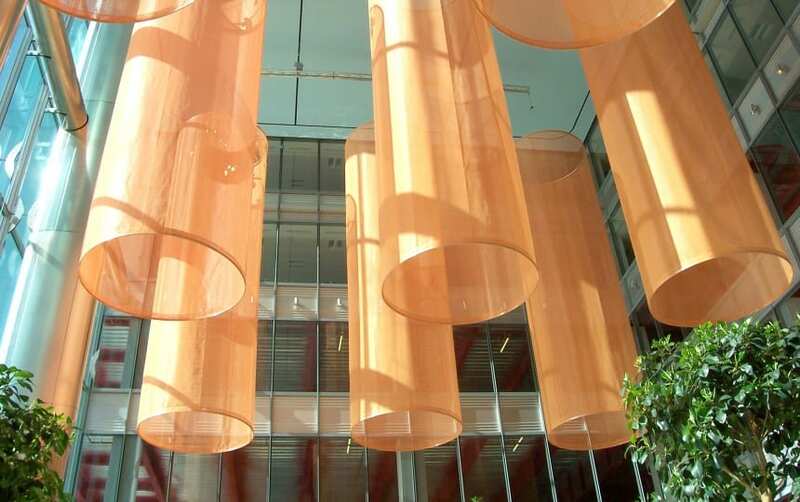 Tensile fabric offers a discreet, cost-effective and striking way of dividing up spaces, controlling foot-flow and enclosing break-out areas and meeting spots. The fabric can be semi-translucent or totally opaque, offer projection surfaces for presentations, and include acoustic absorption to enhance privacy. Tensile fabric panels can be used as cost-effective and more aesthetic alternatives to traditional suspended ceiling systems and wall panels, with visual interest and 3D form easily added as part of the design process. Panels can be modular, lightweight, and easily removed for access and maintenance. Nearly all of our fabrics can be printed digitally or by using dye sublimation, which makes promotional branding, personalising, colouring, and addition of artwork simple and cost-effective. Suspended kites within a caf, for example, can easily be printed with the caf name to enhance brand awareness and add more cohesion to the overall dcor. Similarly, a fabric screen or sail behind a corporate reception desk could feature the company logo or relevant artwork. The nature of tensile fabric forms means they lend themselves well to both external and internal illumination. At Architen Landrell we have our in-house lighting division that uses the latest cutting-edge technology to enhance our fabric structures when required. Lighting can be fully programmable, switchable or fully automatic and can be used to make the structures glow, pulse, and change colours. Fabric is an excellent light reflector, but as well as illuminating the fabric products themselves, lighting can be incorporated as part of the overall building strategy, with direct lighting built into the fabric framework or with the membrane itself acting as a diffuser for ambient artificial light.